Hey Pat I’m sorry, but I killed your hops. I know you entrusted them to me while you’re overseas for a couple years, and I’ll admit the task really wasn’t that hard. Two big buckets of dirt that need water and sunshine so the hops growing in them don’t die. Well I gave them a prominent spot on the sunny-side of my backyard, you know the side I plant the garden on? Yeah, and they are also within reach of the sprinkler’s throw so I know they got enough hydration. I even weeded them regularly to ensure they weren’t being choked out. Heck, for the entire first year you were gone the actually grew like gangbusters (whatever that analogy is supposed to mean, I have some doubts about “gangbusters'” potential for growth myself (look close, there’s a plural possessive mixed into those quotes, it makes sense but it’s hard to see)). They climbed out of their buckets and found the twine I’d strung upward to the fencepost and trained around it. 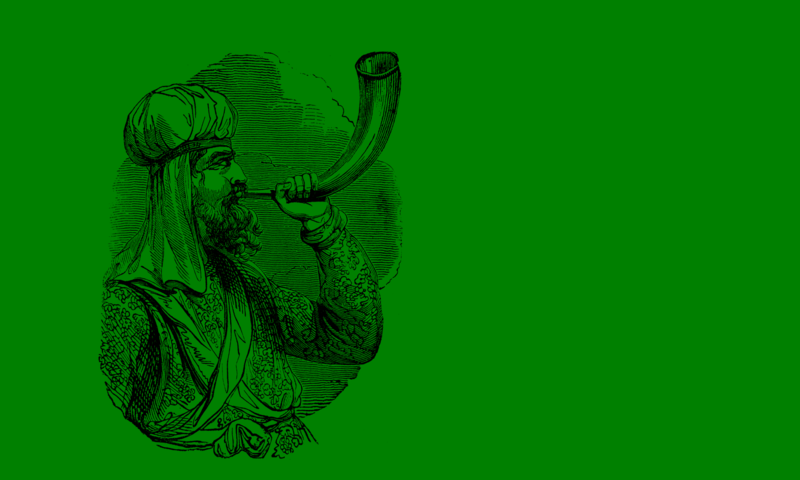 They wound up all green and leafy (but never actually flowered, so their viability for brewing was questionable even before the matter was finally settled upon their brown and desiccated death). They made it to the top of the fence and struck out for freedom; ran out to the sideyard and entangled with the decorative shrubs out there, all harmonious-like. I kept checking them for flowers, thinking maybe I could “harvest” a couple for you and freeze them or something… as a lark. Sometime after that first year one of the pots was colonized by ants. I knew it had happened, but not only was there not much I could do about it but I actually figured it might be beneficial for the root system. I’m not saying this ant manifest destiny is what did that one pot in, but I guess they could’ve been feasting on the roots and I’d have been none the wiser. The anted pot did seem to turn first, though. It never grew as vigorously, was less leafy and overall healthy-looking than its partner. Were I one of those vegan connected-to-the-earth types I might think that the vibrant one missed his runty friend and simply wasted away in despair after its loss. And now it’s just one big sad funeral scene out there. 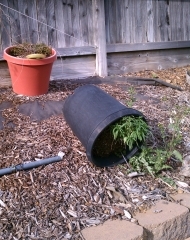 We had some bad wind last week when a storm blew through and it toppled the pot of what used to be the stronger of the two. It’s now laying on its side halfway down the slope, threatening to spill its contents, which probably didn’t happen only because the roots of the weeds growing within held the stuff together. Later today I’m planning to go out there and right the poor thing, say some benediction and get on with the grieving period so I don’t feel too bad reclaiming the soil for other purposes. Like the Bible says – dust to dust. I’m shrugging. It happens. I owe you some hops. You sure do, those cost me like $8 each. It’s not like I’ve asked you to do 10,000 things while I’m gone and you messed up the least significant of them. a whole post! you should not feel this guilty! what kind of hold does pat have over you? !